Welcome to Today@WKU, the daily newsletter from WKU Public Affairs, for October 15, 2018. 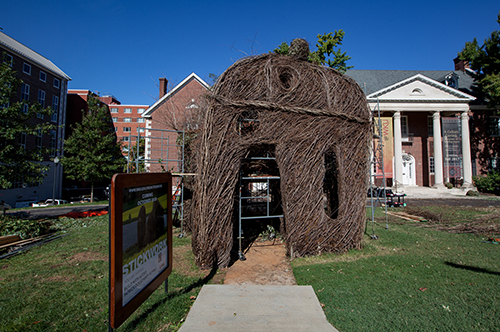 The Stickwork at WKU opening reception will be held at 5:30 p.m. Friday at the Kentucky Museum. WKU Kentucky Folklife Program Director to Speak at Smithsonian Symposium: On Oct. 23-24, WKU’s Kentucky Folklife Program and Kentucky Museum Director Brent Björkman will speak at Building Bridges: A Symposium on Global Cultural Heritage Preservation about the community engagement work he has been involved with, centering on the Bosnian Oral History Project and current exhibit, A Culture Carried: Bosnians in Bowling Green. This symposium, coordinated by the Cultural Heritage Coordinating Committee (CHCC), and taking place at the Smithsonian Castle Commons in Washington DC, is dedicated to exploring how the United States might better help protect and preserve cultures around the world by cultivating an open dialogue about cultural heritage preservation between government and non-government organizations, the private sector, and university and research communities. View from the Hill: WKU's role in UK College of Medicine-Bowling Green Campus: Training physicians in Kentucky for Kentucky. That’s the mission of the UK College of Medicine-Bowling Green Campus. WKU's Amy Bingham has more on the role WKU plays in this important partnership in this week’s View from the Hill. ASCE Student Chapter Lends a Hand: The WKU American Society of Civil Engineers (ASCE) student chapter helped raise money for the Monroe County Backpack Program. Soccer: WKU Rallies Twice from Two-Goal Deficit, Draws 3-3 Against Rice: WKU trailed by two goals on two separate occasions against Rice on Sunday afternoon, but a strong rally over the final 30 minutes of regulation gave the Lady Toppers a hard-earned 3-3 draw over the visiting Owls at the WKU Soccer Complex. Next: WKU at UAB on Friday. Men’s golf: Hilltoppers Back in Action in Georgia After Long Hiatus: It will have been almost exactly a month since WKU Hilltopper Golf completed a tournament round when the team tees off this week in Georgia State's Autotrader Collegiate Classic. After getting rained out at an event in Cincinnati, the Hilltoppers return to the course in competition for the first time since completing the Louisville Cardinals Challenge on Sept. 16. Football: HIlltoppers Downed by Charlotte in C-USA Road Opener: A big third quarter by the host Charlotte 49ers proved to be the difference as WKU (1-5, 0-2 C-USA) fell in their Conference USA road opener, 40-14. Next: WKU vs. ODU on Saturday night. Volleyball: Anderson Records 400th Career Block in Loss to UAB: WKU senior Rachel Anderson became just the third player in Lady Topper Volleyball history to record 400 career blocks on Friday night as the Lady Toppers fell to UAB in four sets. The Blazers took down the Red and White by scores of 25-22, 25-23, 17-25 and 25-17. Next: WKU at Austin Peay on Tuesday night. Hilltoppers primed for more big Diddle Arena crowds: Crowds poured into E.A. Diddle Arena last season like they hadn’t in a decade. WKU drew 5,487 fans in 2017-18 for its home games. That marked the Hilltoppers’ best average attendance since 2007-08 (5,564) and was a sharp increase over Diddle Arena’s 2016-17 average (3,915). If preseason ticket sales are any indication, WKU figures to attract large home crowds again this season. Winter Term Registration Begins. Contact Winter Term, (270) 745-2478. 7 p.m.: DiscoverWKU Evansville. DoubleTree by Hilton Evansville, 601 Walnut St., Evansville, Indiana. Contact Admissions, (270) 745-2551. 9 a.m.: FAFSA Application Day. WKU Glasgow Campus. Contact WKU Glasgow, (270) 861-6900. 4 p.m.: Social Justice Salons: Domestic Violence and Vicarious Abuse: Inside an Exchange and Visitation Center by Dr. Dana Cuomo, Diversity and Community Studies. Downing Student Union, room 2113. Contact Center for Citizenship & Social Justice, (270) 745-3218.